The legend of Nessie comes to life with this adorable ride-on toy. This Ride-On Nessie from Children's Factory is soft, lovable and a great addition to any preschool or child care environment. This super-cute ride-on toy can be used by one child or in pairs. The two seats of varying heights make it ideal for encouraging social interaction, turn-taking and imaginative play, and let little ones sit down easily and safely. The solid foam core is covered in nylon-reinforced vinyl for a toy that is soft and huggable yet highly durable as well. The bright colors and cartoon-like design appeal to children, while the easy wipe-down surface and low maintenance appeal to caregivers. 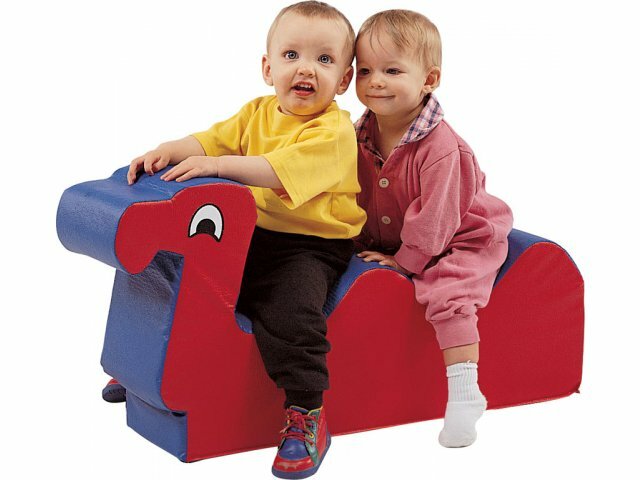 Low enough for crawling babies yet fun enough for toddlers, this soft ride-on toy will endear itself to little riders, right from the start. Lovable: Cartoon-like design makes this rocking toy adorable and lovable to kids. Cheerful: Bright colors appeal to children and add cheer to child care environments. 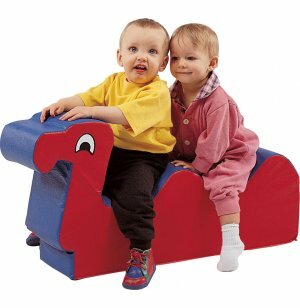 Comfortable: Solid foam core is gentle and soft, making this rocking toy especially comfortable. Extra-Durable: 14 oz., nylon-reinforced vinyl is highly resistant to tearing. Easy-to-Clean: Vinyl surface wipes down easily for low maintenance and maximum hygiene. Fire-Safe: All Children's Factory products adhere to California Fire Code Requirements.